Public education in the U.S. is a broken system. When one school has a college-like campus but another one can’t even afford enough books for its students, something has to change. Directed by Davis Guggenheim, Waiting for Superman tries to shed light on this subject by looking at the past and predicting the future. The film takes several different tracks. The first follows five families who enter lotteries to try to get their children into better schools. Waiting for Superman also examines the history of public schools and how these were formerly the best schools in the country. It then looks at current problems with public schools and finally suggests solutions. The information is mind-blowing, especially one scene in particular which shows a chart of the “education gap” versus the money spent on education. It was shocking to see that it’s been unchanged for three decades. The statistics provide a good break from the film while offering meaningful information. The families that they follow are heart-breaking, and Waiting for Superman challenges the viewer to think of better ways than watching children hope to win a lottery to get a better education. With that being said, the film does show bias. It spends a lot of time bashing teachers’ unions (which are honestly not great in my opinion), but unions are not the only contributors to the problem. Anyone who has children or who is interested in education should see this film. 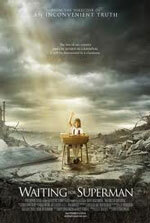 Waiting for Superman is thought-provoking and sweet; it’s suspenseful while also being informative. This film isn’t perfect, but it does a great job telling you that there is a problem and it makes you want to fix it. A documentary is supposed to inform while being enlightening; it’s supposed make you think and, hopefully, want to engage. This film does that and more. This review doesn’t come close to describing the greatness of the film: I can honestly say that this is one of the best documentaries I’ve ever seen.